NASA’s New Horizons spacecraft is currently hurtling towards MU69, a Kuiper Belt object located a billion miles past Pluto. Details of this distant object just keep getting more intriguing. 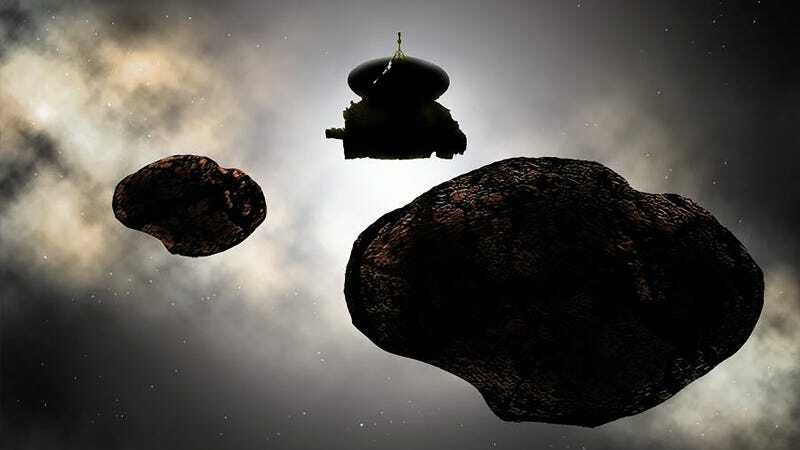 In addition to having a reddish hue and potentially consisting of two self-orbiting objects, MU69 may have a small moon, the latest research suggests. So what we once thought was a single object might actually be three. On New Year’s Day 2019, New Horizons will zip past MU69, and by all accounts we’re in for a treat. Similar to how New Horizons snapped photos and took measurements during its historic Pluto flyby, we’ll finally be able to see MU69 from a remarkably close distance. It is about four billion miles from Earth, so at that distance, we’ll have to wait about six hours for New Horizons’ transmission to reach us. Given that New Horizons will have been traveling for nearly 13 years by that point, it’ll be well worth the wait. Until then, astronomers on Earth are working hard to observe and measure MU69 by other means. Back in October 2016, scans made by the Hubble Space Telescope suggested the object has a discernibly reddish complexion, similar to the reddish-brown splotches observed on Pluto. This could indicate the presence of tholin, a class of molecules that is produced through the ultraviolet irradiation of simple organic compounds such as methane and ethane. And in August of this year, when MU69 conveniently passed in front of a star (an “occultation” event), astronomers realized they’re dealing with either an elongated, peanut-shaped object (similar to comet 67P/Churyumov–Gerasimenko), or two asteroids orbiting each other (i.e. a binary system). So it’s either one object measuring about 20 miles (30 km) long, or a pair of objects each around 9-12 miles (15-20 km) in diameter. And now, as New Horizons scientists disclosed at a recent meeting of the American Geophysical Union, MU69 is not alone—it has a small moon. Or, at least that’s what the latest data suggests. On July 10, during a different occultation, NASA’s airborne Stratospheric Observatory for Infrared Astronomy (SOFIA) detected an apparent short drop-out in the star’s light. This “blip,” according to NASA, is likely caused by another object around MU69. So how cool is that? New Horizons will be busy during its flyby, having to observe as many as three different Kuiper Belt objects (assuming MU69 is truly a binary). In addition to providing what will undoubtedly be some very cool photographs, the New Horizons flyby of MU69 will also provide crucial information about the remnants left over from the formation of the Solar System.